So what does nature do? It has an arsenal of nasty tricks: earthquakes, tsunamis, hurricanes, cyclones, tornadoes, mudslides, windstorms, snowstorms, ice storms, sandstorms, firestorms, floods, droughts, avalanches, sinkholes, pandemics, and the rest of the worst that we think of as natural catastrophes. Nature’s destructive side often makes headlines. At the opposite extreme is nature as shown on monthly calendars: scenic, subtle, serene, colorful, majestic, calming, dramatic, inviting, exhilarating, glorious, beautiful, cute, adorable, and so on. Nature is inherently neither one nor the other. It is what we make of it, depending on what we want it to be in a given situation. 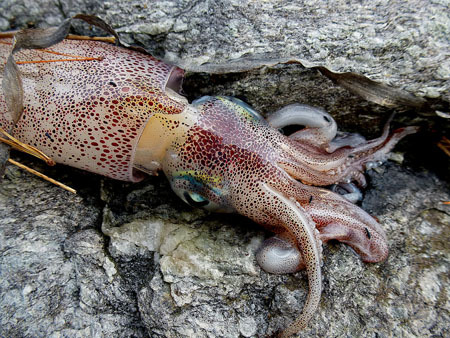 A dead squid does its best to match the pattern of the rock beneath it. Largely, nature is a high-level abstraction built up from our cumulative experience in natural settings over a lifetime. Yes, it is subject to seasonal and daily variations. 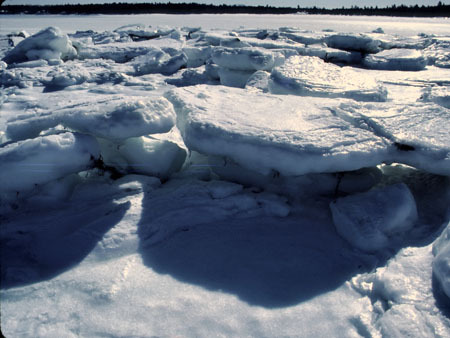 It has a lot to do with flowing water, both fresh and salt, hot and cold. And sunlight, which depends on clouds and where the sun is in the sky. The topic of nature brings wild animals to mind—birds, snakes, salamanders, fish, marsupials, mammals, dinosaurs, whales, insects, spiders. Too, nature is a hard and gritty place, full of rocks, cliffs, mountains, boulders, pebbles, sand. Then there are the stars, which are so remote as to form a special class by themselves, in the company of asteroids, meteors, comets, planets, galaxies, nebulas, and much closer to home, auroras. A few of the shapes and colors of nature. For me, nature brings to mind experiences I’ve had outdoors in the fresh air. The first such foray I can recall is looking for mayflowers with my mother and two brothers by peering under leaves released by melting snow. My mother was from Maine, so she knew about such things. That was near Hamilton, New York, almost eighty years ago. Where we also went outdoors in winter to cut a balsam fir that we took indoors and hung with decorations. 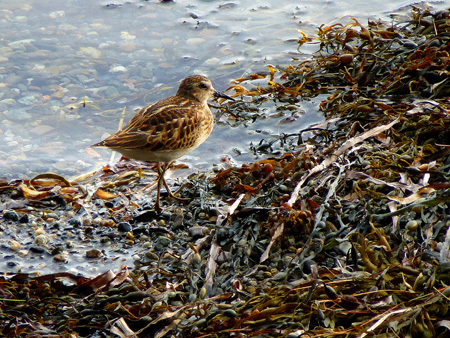 The protective coloration of a least sandpiper matches its native habitat. I also remember eastern cottontails sitting still behind every stump and standing tree on a small island that had recently been cut-over for timber. That and raspberry bushes scratching my legs. A few years later, I hiked with my family to the fire tower on top of Schoodic Mountain, near where my mother grew up. We climbed through stiff summit winds on a rickety ladder to talk with the fire ranger in his tower standing over his plane-table map of surrounding terrain, a man who wouldn’t look us in the eye because he was so watchful of the forestlands stretching around us in every direction, on the lookout for faint wisps of smoke. 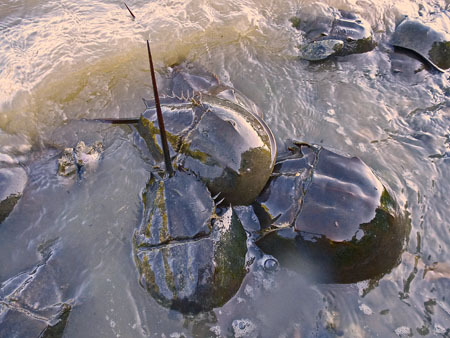 Wave-tossed horseshoe crabs mate in Taunton Bay, Maine. As a boy in Hamilton, I spent many Saturdays in March and April roaming surrounding hills, drawn by meltwater forming little rivers rushing into the valley. I dammed those rivers by poking palisades of twigs into damp soil, got sopping wet head-to-toe, and had the time of my life. In summer, I explored creeks flowing from those same hills, looking for fossils in the black layers of slate that formed the walls those creeks had dug into bedrock. Crinoids. Fluted mollusks. Trilobites of all sizes. I learned to take hammer and chisel with me to break into natural cracks, freeing the wonders within. An ancient birch extends one last limb into the canopy to catch a few rays. 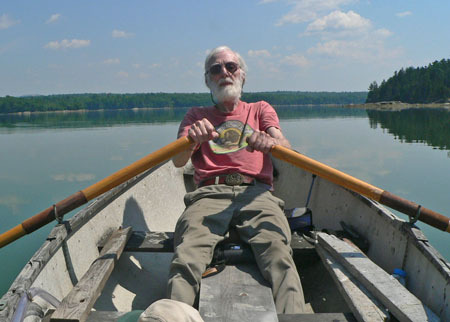 That’s who I still am today, Steve from planet Earth, poker of twigs, launcher of leaf boats, pryer-loose of fossils, staunch defender of watersheds and the life they support. Later, just after the war when I was fourteen, I stood looking from the shore of Lido Key in Sarasota out over the Gulf of Mexico, and saw without warning a great manta ray lift from the gulf, hover above the surface of the water, and glide back into the depths, something I had never imagined before and have never seen since, that single experience alerting me to the possibilities offered by a lifetime of curiosity, exploration, and discovery. Which I am living to this day in exploring and writing about my own mind. I take the sight of that manta as the very emblem of who I was then and still am, an Earthling to the core, alert to the natural wonders of my home planet. I personally view my loops of engagement as supporting my consciousness on four distinct levels: Nature, Culture, Community, and Family. Nature presents my view of the planet I was born to, Earth, third planet out from the sun. 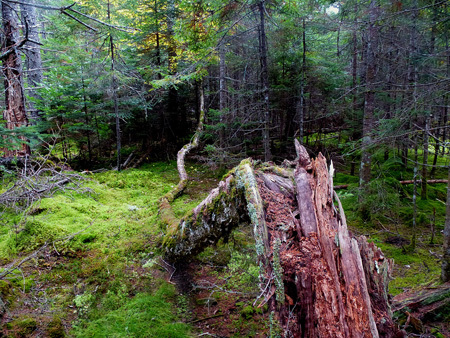 I am very active in my local segment of nature as exhibited on Mount Desert Island in Hancock County, Maine. 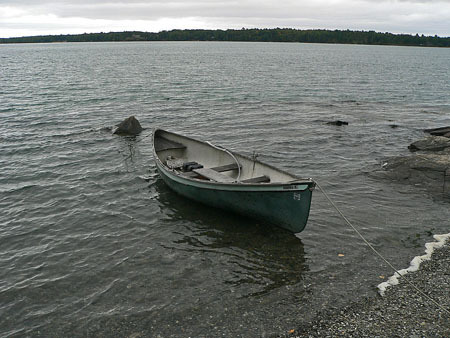 Too, I frequently spend time on the shores of Taunton Bay, headwaters of Frenchman Bay. 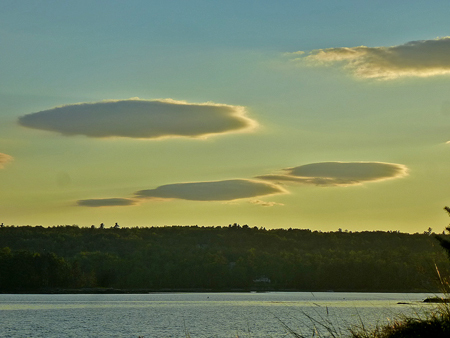 Taunton Bay is—as Canada geese fly— ten miles north of Bar Harbor. My special interests are watersheds, estuaries, horseshoe crabs, and primary producers such as phytoplankton, salt marsh, eelgrass, rockweed, and kelp. 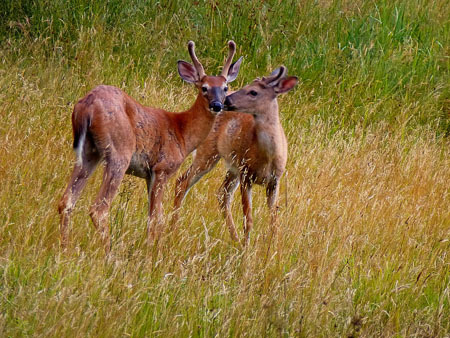 Two young male deer in a meadow just down the street where I live. Culture presents my view of the doings of the human subgroup I was born to, the activities of my kind of people. This includes roughly my engagements with those on the East Coast of the United States, especially in New England, and particularly in Maine, most north-easterly state in the nation. 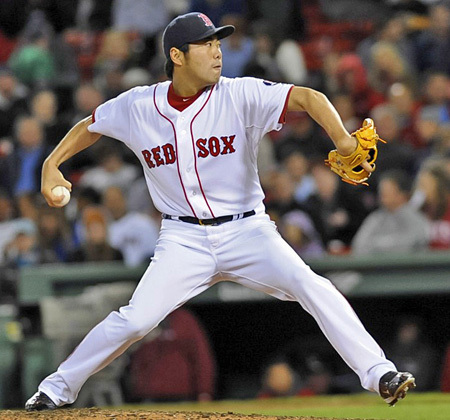 Baseball is one of my favorite cultural engagements. Community presents my view of engagements within the local coastal area where I now live, centered on Bar Harbor, Maine. Bar Harbor is largely a tourist town in the summer, a small New England village in the winter. 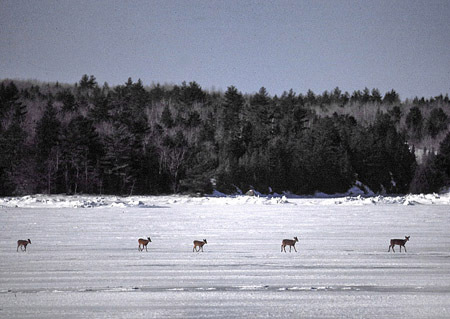 It boasts two biological research laboratories, a small college, and the headquarters of Acadia National Park. 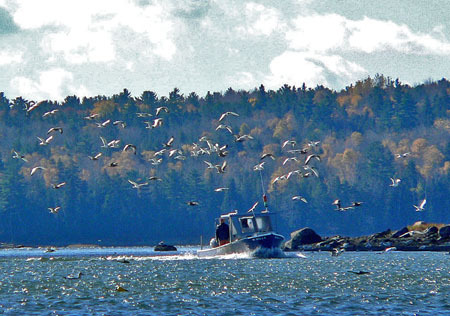 Lobster fishing is the most notable fishery along the Maine Coast where I live. Family includes lifelong engagements with members of my birth family, my two marriage families, and their respective relatives. I grew up in Hamilton, NY, moved to Seattle when I was fifteen, came back to the East Coast to attend MIT (for two years), another two at Columbia in New York City. I served in the U.S. Army Signal Corps for two years, mostly spent in West Germany. I worked as a photographer in NYC, spent time in Iowa at the State University, then moved to the Greater Boston Area. I moved to Maine in June, 1986, and have been here ever since. 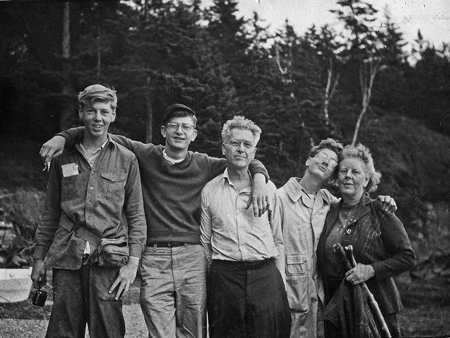 My birth family on Taunton Bay in 1949. My parents and two brothers (the 4 on the right) are now dead. Now with a gray beard, I am the one on the left. On a personal level, I am occupied by projects relating to consciousness and introspection, including two books, a number of PowerPoints, and this blog. My goal is to complete writing down my current understanding of consciousness before I die.